Unique Sapphire Engagement Ring : LOVE2HAVE in the UK! A very contemporary shaped sapphire engagement ring in silver with an orange sapphire for ladies who want something unique with a bit of fiery designer styling. 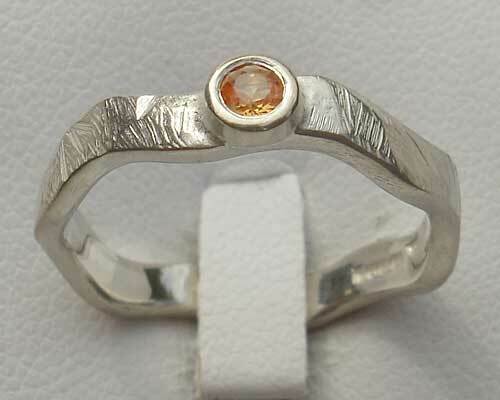 This engagement ring is made from sterling silver and comes set with a 10pt (3mm) orange sapphire in a collet. The ring has a handmade textured surfacing with a shaped wave design style. Its approximate width is 3mm, and it makes a unique engagement ring set as a plain matching wedding ring is also available. Please contact us for further details if you require the plain wedding ring also. Our wavy styled collections come in elegant designer styling and are all very individual. Precious stone(s) Available: 1 x 10pt (3mm) orange sapphire. Returns Policy: You may return this UK made sapphire engagement ring if it is not to your satisfaction as long as it is not engraved. Please see our terms and conditions.